Tunic is foam backed fabric w/ printed design on "fingers"
After you were done making the Thanksgiving themed masterpiece, you brought it home to your mother and she loved it. In fact, she even hung it up on the fridge so all your dinner guests could marvel at it. Fast forward 20 years later and now it's totally unacceptable to bring home a hand turkey for Thanksgiving.Your mom will look at it and say why didn't you bring the stuffing? The rest of the family would be equally confused by your offering. You see, when you get to a certain age, your family (even your mother) won't be impressed by your hand turkey anymore; they'll expect more from you. That's where this adult hand turkey costume comes in! Your family may no longer be dazzled by your work of art, but maybe they'll change their tune when you show up to the Thanksgiving feast dressed as an actual hand turkey. 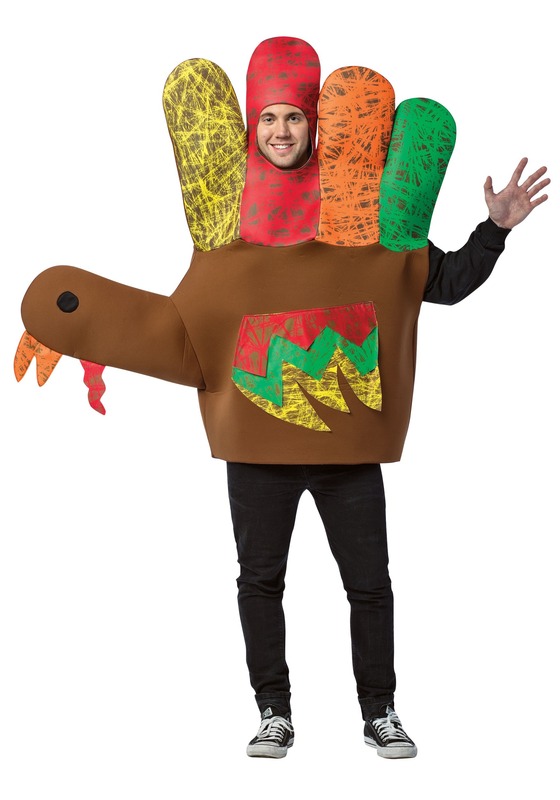 This hand turkey costume looks exactly like the drawings you made back in elementary school. The plush over-the-head costume features colorful feathers (or fingers, however you choose to look at it) and cutouts for your head and arm. Your other arm is used to fill out the turkey's head! Your artwork might not suffice as an adequate contribution anymore but your family will appreciate your boldness when you sit down to break bread wearing this. The next time your mom asks you what you brought for Thanksgiving you can proudly say that you brought the entertainment! Standard Chest Up to 60" Up to 60"